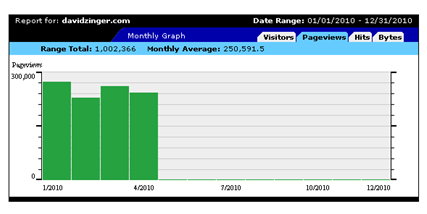 1,000,000 page views in under 4 months in 2010. Thank you one million times from David Zinger to everyone who has read a page from this site. According to Google’s Urchin 3 statistics, David Zinger’s Employee Engagement site just reached the one million page view mark in under 4 months! Congratulations David. Your dedication, brilliance and hard work earned every one of those page views. They are all well deserved. You are very kind and more than that I experience the contribution you made to this with a focus on my two word genius.